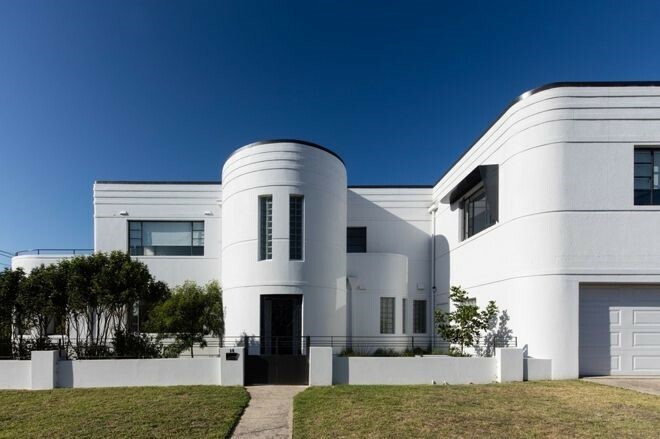 This heritage listed house was built in 1949 in the Inter-War Functionalist style with references to European modernism and features of Art Deco. The significant features of this style of house are not always clearly understood nor appreciated. For this reason, it is incredibly important that any renovation is driven by a skilled architect. The brief for the renovation was to improve the functionality of the building with the addition of an extra bedroom, updated kitchen and bathrooms, and a lounge and dining area opening to the outdoors. Aside from a small addition on the first floor over the old garage, the renovation was largely contained within the original footprint. The major challenges that faced the architect, Sam Crawford Architects, included the fact that the house is located on an exposed cliffside and that it had been subjected to unsympathetic alterations in the late 1990s. These previous renovations had removed many of the original features and resulted in cramped interior spaces. 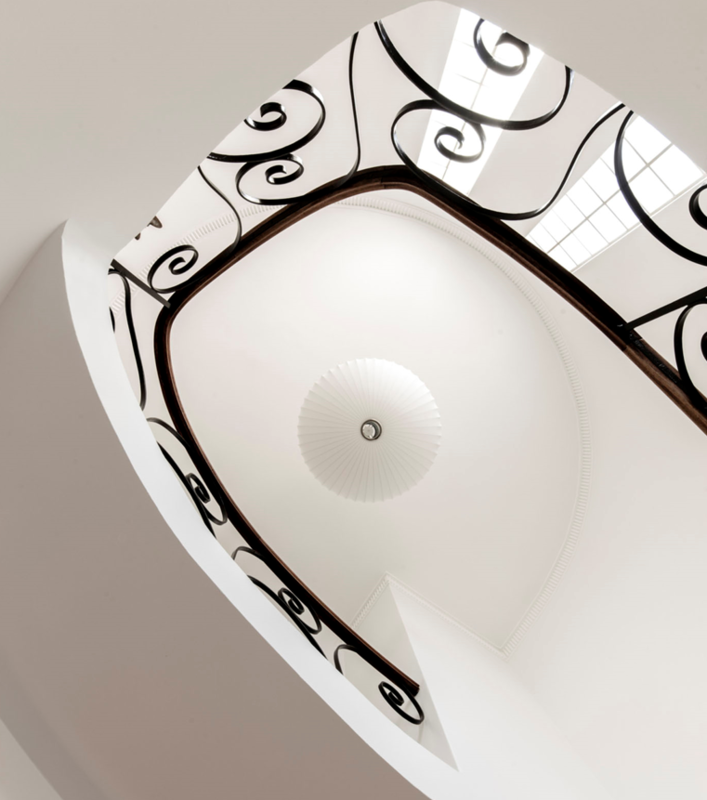 The architect has been inspired to recreate the sense of hand craftsmanship throughout. The new interiors involve a lot of curvaceous spotted gum joinery referencing the features and design of the original home. A number of significant original features were restored such as the brass window joinery. Using a simple colour palette and humble –materials such as timber and concrete, the architects have managed to retain the original architectural aesthetics of the house while updating it for contemporary Australian living. The floors are poured concrete and the concrete kitchen island is an important new feature. Lighting was obviously an important component, with three custom light fittings designed by the architect and crafted for the project by lighting makers Light Shed, the design influenced by the restrained elegance of mid-century modern furniture making. 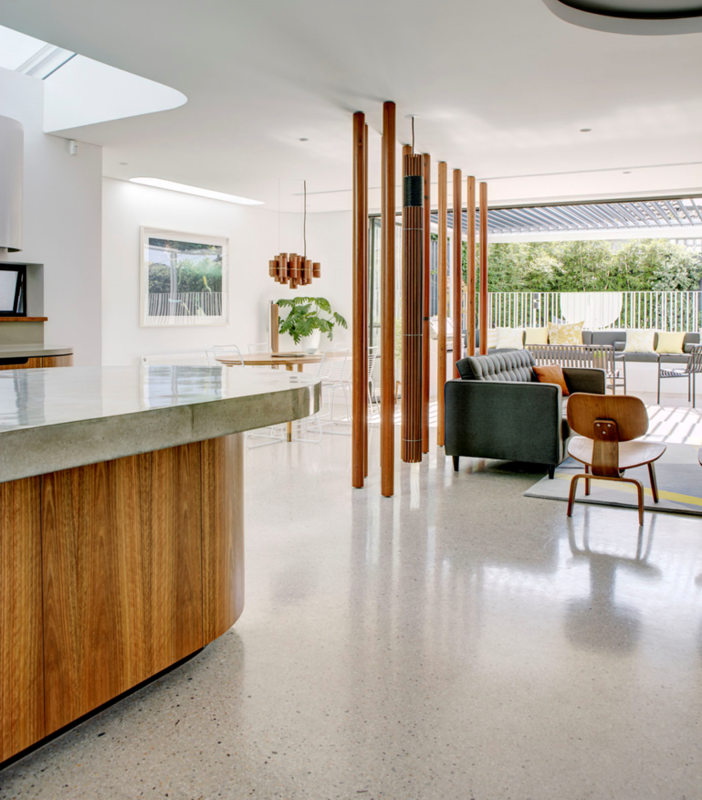 The ground floor now hosts the living and dining spaces divided by a spotted gum timber screen. The home’s exposed cliffside location required a series of shading elements and careful new openings to control light as it enters the space. 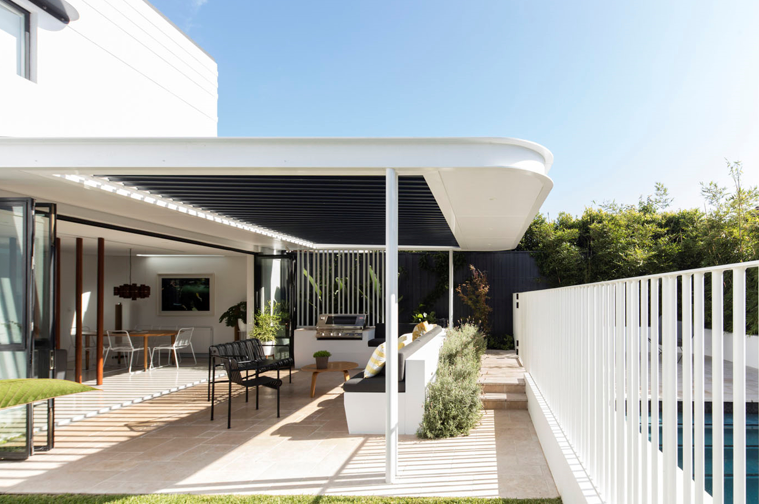 The curves of the original Art Deco exterior are echoed on the louvred pergola that shelters the outdoor dining and barbecue area – an ideal spot for entertaining. According to the architect sustainability was considered a priority for the owner. 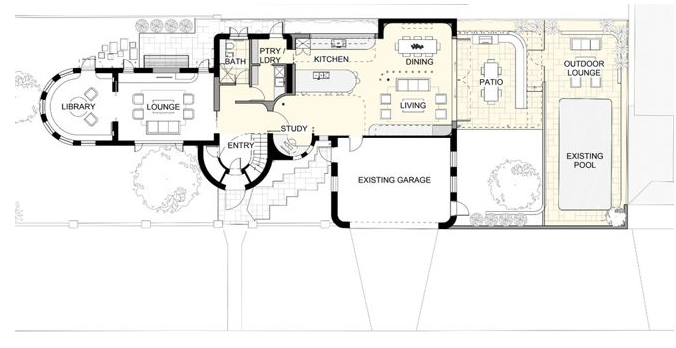 Passive solar design techniques have been deployed throughout the redesigned home to shelter the interior from the hot sun, while opening it to cooling coastal breezes. 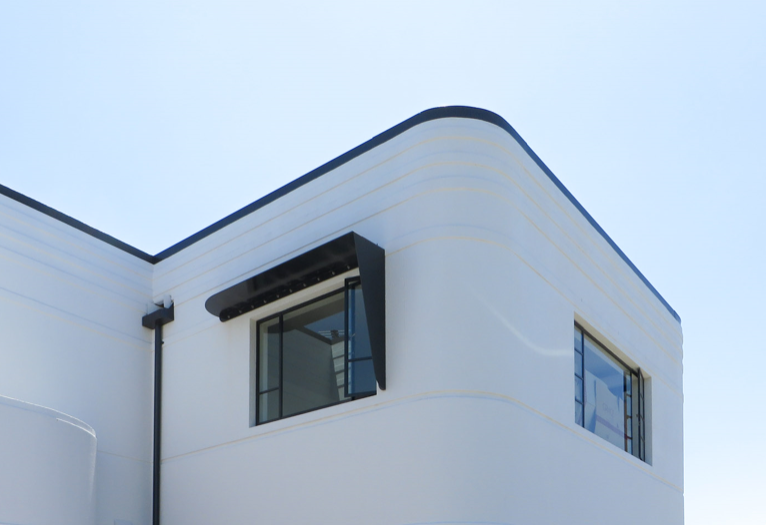 “Working mainly within the fabric of the original property, which is listed as an item of local heritage significance, we were inspired by the humble materials and bold formal devices of the Depression era and immediate post-war style, now described as Inter-War Functionalist,” says Crawford. This is a very important example of how these buildings can be made extremely relevant today through subtle but effective reinterpretations of this increasingly rare design language. We love.